DISH is like an oasis in the desert for the football fan. Love college football? DISH has got you covered with the most Division 1 action in satellite television. Get every big NCAA football game and cheer your alma mater to glory on Saturdays. When Saturday ends and Sunday begins, the NFL takes over on DISH. With all the ways to watch football content, you will get your fill of NFL news, highlights and action, whether at home or on the road. Score a touchdown with DISH Football today, and OWN Football. Want to know what channel football is on? Check our dedicated football webpages to find out when and where your favorite College and NFL teams play. DISH delivers what some cannot with the best in Pac 12 and Big Ten action, even if you’re out of the conference broadcast footprint. Want to follow your favorite Pac 12 or Big Ten team even if you’re living in a city outside your conference area? No problem, because you can get the action regardless of wherever you call home. Are you a fan of the SEC conference or the Texas Longhorns? DISH has got you covered with the SEC Network and Longhorn Network, bringing you channels dedicated to some of your favorite conferences. It's the icing on the cake that provides DISH viewers the most Division 1 college football. Who wouldn’t want a slice of that action? DISH knows the NFL fan because we are football fans. Fans want NFL content and they want multiple ways to watch. Whether it's catching the latest NFL news and reports at home while watching the NFL Network, or recording games on your Hopper 3 while watching your favorite show, allowing you to watch the game in its entirety at a later time. Track your favorite fantasy players watching the NFL RedZone on your mobile device through DISH Anywhere. DISH has got you covered so you can watch the football you love, in the ways you love to watch. With DISH Multi-Sport, you get the fiercest NFL duo since Montana and Rice, Aikman and Smith, or (insert your favorites here). NFL Network gives fans a steady fix of football related content all off-season and leading up to gameday. From topical roundtables and morning shows, to programs dedicated to breaking news within the pro football realm. Get original documentaries and specials and even NFL action with 16 televised preseason games and live football action on Thursday nights. Want more? Then switch over to NFL RedZone channel to get fantasy football insights and 7+ hours on Sundays of live and highlighted league action. Watch the scoring drives of all morning and afternoon match ups, ensuring you will never miss a score. Track your favorite fantasy players while watching the NFL RedZone with your mobile device, through DISH Anywhere. DISH has got you covered, so you can watch the football you love, in the ways you love to watch it. DISH knows that the most important part of the watching the game is the experience. DISH aims to bring fans of football the most immersive experience possible with all the features available through DISH. Want to keep up with scores and stats? With the Gamefinder feature you can do just that, always staying informed on the progression of any game you like. Then fire up the Multiview option on your Hopper to view up to 4 games at once, turning your living room into the ultimate viewing center, making sure you never miss the action. 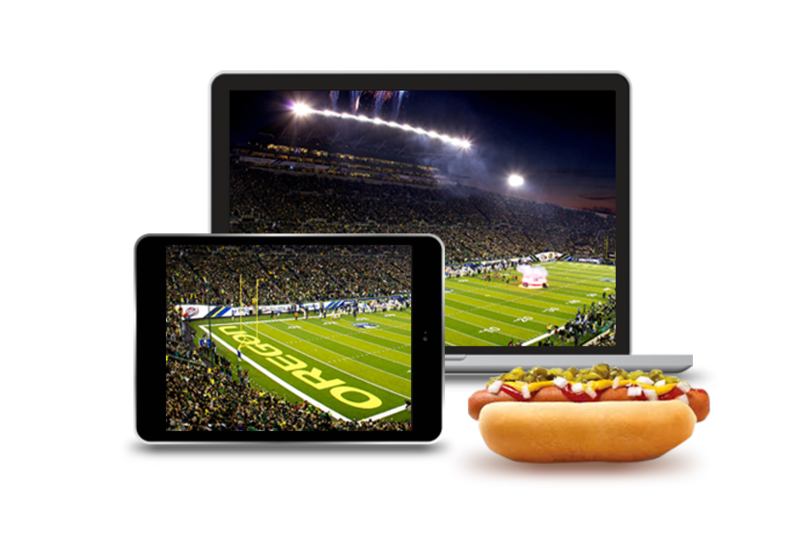 If you can’t be home to watch the big game, then use DISH Anywhere to watch 100% of your content live on your mobile device and get into the game from the road!